Aliyev Etibar was born on the 11th of July 1955 in the city of Lankaran. After graduating from the eighth grade in 1969, he obtained a profession of a carpenter from vocational school #34. In 1973 Aliyev was called to military service. He completed the military service in Saratov region, Russia. And in 1975, he returned home and began to work in the Office of Consumer Services of the Population of the city of Lankaran. After working there for a while, he then started working in Canning Factory and later, in a small business called “Sevinc” in Lankaran city. Aliyev was actively involved in the socio-political events that took place in our country being one of the leaders of the People’s movement. Etibar was willing to give his own life for the independence of his country and the soldiers of the Soviet Army kept him under arrest for 30 days in 1990. And the black clouds over the country started to emerge. On 23rd of August 1993, a group of aggressive separatists in the southern region of Azerbaijan were trying to create "Talysh-Mugan Republic" in order to try to bring the country into chaos. In these difficult days, many innocent people were killed. Etibar Aliyev, showing particular activity was in the forefront during many operations. He heard "Bravo! Ahsan"! from everywhere. The bullets of the ignoramus and ungrateful did not just pass him by. Unfortunately, he was killed. Aliyev showed formidable heroism in his path to save the Integrity and sovereignty of the Motherland. He was married being a father of two girls. 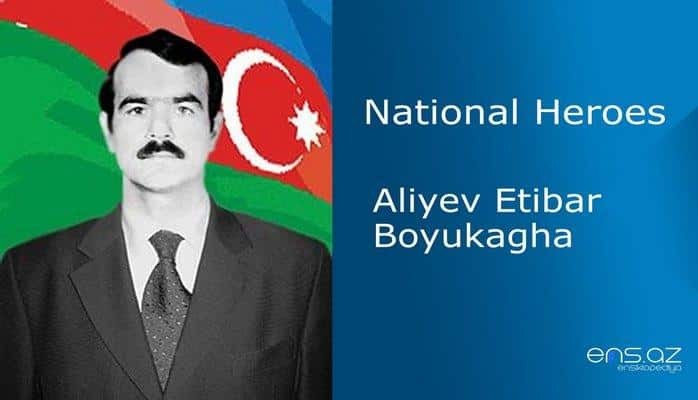 Etibar Aliyev was posthumously awarded the title of "National Hero of Azerbaijan" by the decree no. 740, dated on the 24th of August 1993 by the president of the Azerbaijan Republic. He was buried in the alley of Martyrs in Lankaran. There is a street in the city of Lankaran. Also a bust was built at the city square called "August 23".